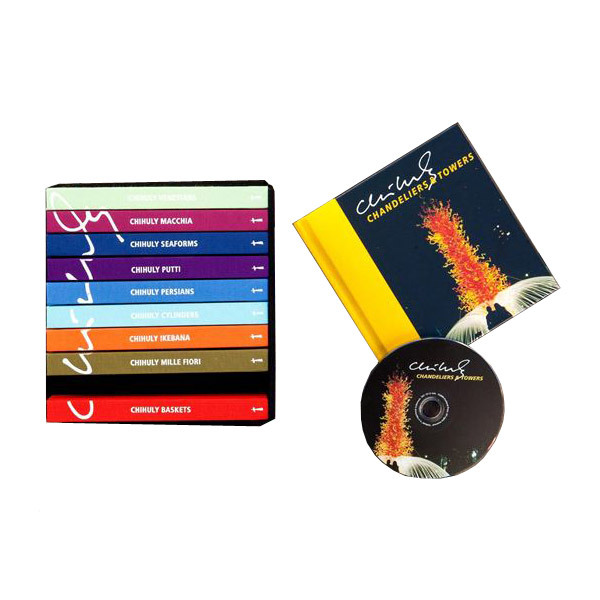 This is a complete collection of Dale Chihuly's most popular series, handsomely packaged in a boxed set. This set is composed of 10 hardcover books and approximately 150 minutes of bonus DVD footage. Series titles are "Chihuly Baskets," "Chihuly Chandeliers & Towers," "Chihuly Putti," "Chihuly Persians," "Chihuly Mille Fiori," "Chihuly Cylinders," "Chihuly Ikebana," "Chihuly Seaforms," "Chihuly Macchia," and "Chihuly Venetians." Each title chronicles the growth of a particular series from the renowned artist's glass sculptures.